Brett Butler of Excel Is Latest LD Products Winner! See What He Won! | Industry Analysts, Inc.
Brett Butler of Excel Is Latest LD Products Winner! See What He Won! Congratulations to Brett Butler of Excel Office Systems out of Los Angeles! Brett is the latest winner in the LD Products contest and has chosen a YETTI Tundra Cooler as his prize! 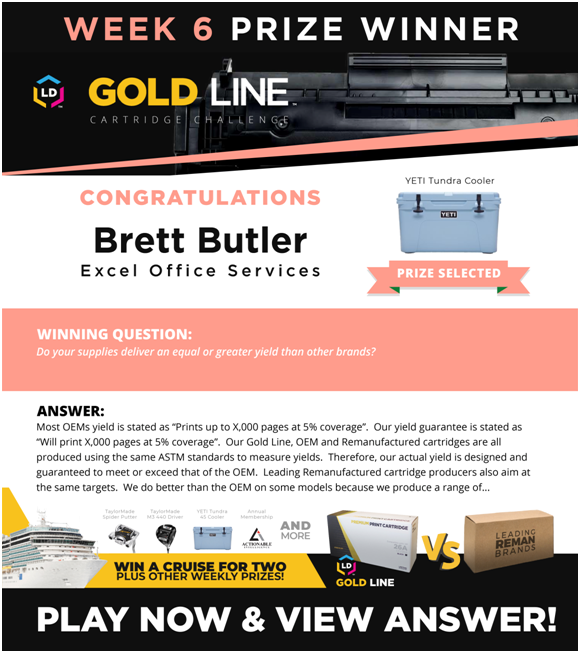 Brett Butler of Excel Office Systems Is The Latest LD Products Winner! This is the sixth week LD Products has announced a winner for asking the right question during their exciting contest. More prizes to be given weekly and a shot at the grand prize – a cruise for two! Click here to take the weekly challenge! Week 5 Winner Of The LD Products Weekly Challenge! Who Won The Latest YETI Cooler??? This entry was posted in LD Products and tagged Brett Butler, Excel Office Services, LD Products, Yetti Tundra Cooler by IA Staff. Bookmark the permalink. ← Previous Previous post: ROAD TRIP! ecoprintQ and Umango on the road in Florida!